Puji Hostel is centrally located, walking distance from many attractions, restaurants, shops and cafes. Come to our hostel to meet backpackers, unwind by the pool or hang out in the common areas.We offer dormitories with 6 beds, 8 beds. If you prefer more privacy, there are also private bungalows. Each dormitory and bungalow has it's own en-suite bathroom including hot shower and toilet, a small terrace and AC. Our guest get free breakfast. 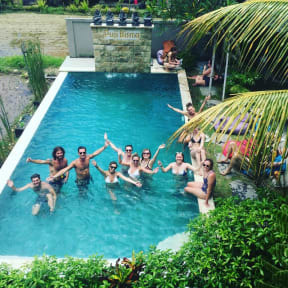 You will be welcomed by our friendly and knowledgeable staff who can help you with tours or transport bookings during your stay in Ubud. One of the most popular activity in Ubud is the Mount Batur sunrise trek which you can book with us. We can also book transportation to the islands Gili, including pick up at the hostel. Small hostel, although quite quiet. Rooms were clean and the bunks have curtains for privacy. Lockers available for valubles. Small pool. Within 10 minutes walking distance to main streets and lots of cafés and bars close by. Very nice hostel. No lock on main door but everyone had their own locker. The swimming pool was nice and free breakfast was good. The rooms were big and the beds were comfy. The shower head kept falling down which was a bit annoying but you could shower. Would recommend. Really lovely place to stay in Ubud. Tucked away from the main bit of the city, so it feels nice and peaceful, but just a few minute walk into the heart of Ubud. Staff was all very nice and happy to help with anything. The rooms were clean and we had decently large lockers to store things. Which is good becausd the doors do remain open for anyone to walk in. But the area in general felt very safe. Would definitely stay again. Close to the main strip of Ubud, there are small lockers in the room to store valuables but other then that the door is left cracked open pretty much all day; if your someone who worries about their big bag items, this is not the hostel for you. Pool is nice and they have a contact with a cheap scooter rental company (50,000 a day) and they also offer a hiking trip up Mt. Batur which was great. Room was not cleaned during our 3 night stay. Staff and 2 dogs are great! Great location and close to everything. Wasn't very clean and my pillow smelt really bad so got them to change it. The staff were helpful and friendly although not very sociable. Can hang out with people here but also easy to avoid people if you just wanna relax by yourself. I would say this is somewhere you stay for a few nights but that's it.